The Mt. Taylor District of the Cibola NF hosted its first aviation history Passport in Time (PIT) project in June, 2009. 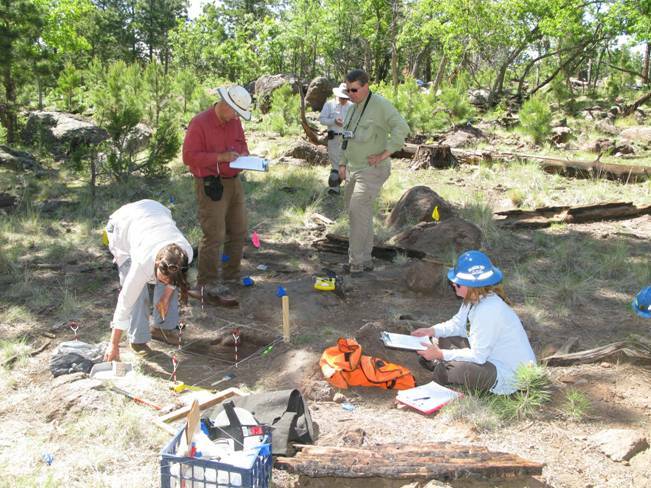 Seven volunteers brought their extreme enthusiasm to a project focused on documenting significant airplane crash sites on Mount Taylor and in the Zuni Mountains, west of Grants, NM. This region has been a major east-west flight corridor since the earliest days of aviation. 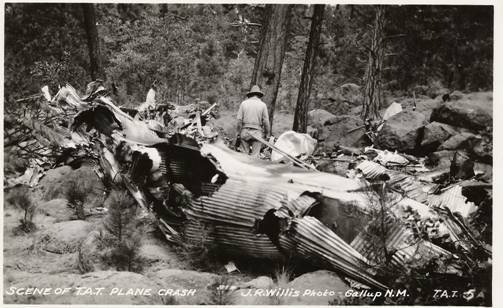 We investigated crashes of both civilian and military aircraft: a Consolidated B-24 Liberator that wrecked into a mountainside during a snowstorm in 1943, and a Budd C-93 Conestoga of the Flying Tiger Airlines that belly-landed and burnt in 1947. But the key site, high on a ridge of Mt. Taylor, was the tragic crash of one of the first US commercial passenger planes. The "City of San Francisco," a Ford TriMotor in the fleet of the Transcontinental Air Transport (TAT), went down in a violent September thunderstorm in 1929; there were five passengers and a crew of three aboard. It was the country's first major airline disaster over land and it had far-reaching effects. It dealt a stunning blow to TAT's "plane-by-day, train-by-night" cross-country service that connected the coasts in only 48 hours. The service had begun just two months before, with the airline's technical advisor, Charles Lindbergh, piloting an inaugural flight. The crash and the long search for the wreckage were major setbacks for commercial passenger aviation, and the Depression was soon to further cripple the industry. The regional lumber economy also suffered since one of the TriMotor's passengers was a New Mexico timber magnate. After his death, it was said of his sawmill operation at McGaffey in the Zuni Mountains: "the heart just went out of it". 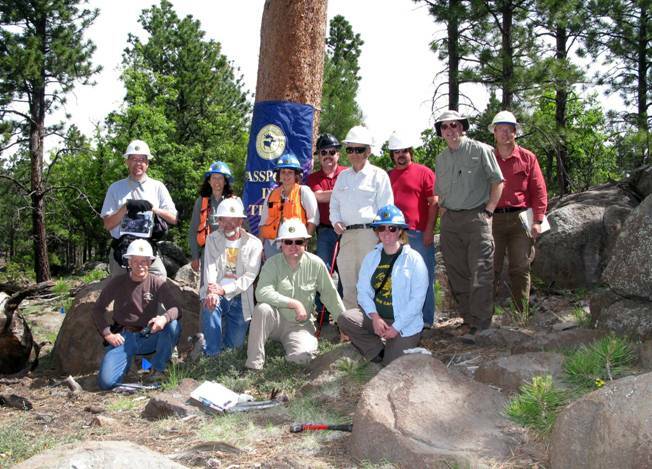 The 2009 volunteers - from Colorado, Arizona, Oklahoma, California, and New Mexico - brought a high level of expertise, which enhanced the project for everyone. Some are experts in the discipline of aviation, including government and civilian crash investigators; others are at the forefront of aviation archeology. One is a rare breed these days: a Ford TriMotor pilot, who intimately knew the plane. Only 2 such planes worldwide are airworthy at the present. The TriMotor crash site occupied most of the team's time. Major debris had been removed years before in a salvage effort. However, volunteers used old newspaper reports and site photographs to orient the debris path and the major crash elements, such as boulders and broken tree trunks. Yes, eighty years later the trunks of trees hit by this plane as it went down are still identifiable. The crash reconstruction allowed the team to locate the main burn areas of the crash site, which is where test excavations were done to determine the depth of aircraft remains. Total station mapping was used to map the virtual forest of blue pin flags, which marked the debris fragments across the site. A key outcome of the investigation is a series of 2009 repeat views of the 1929 photographs taken during initial discovery of the crash. Seemingly not the least bit exhausted by the week's fieldwork, the PIT volunteer team shared their aviation expertise in an evening session of presentations, a special treat for the local people of Grants. Their talks focused on historic crashes in the region, the benefits of plane crash site research both to aviation safety and to history, and the development of a code of ethics in aviation archaeology.